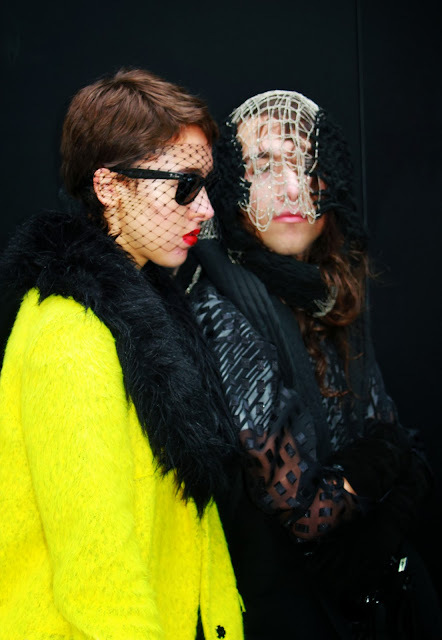 Fashion Obscura: London Fashion Week! 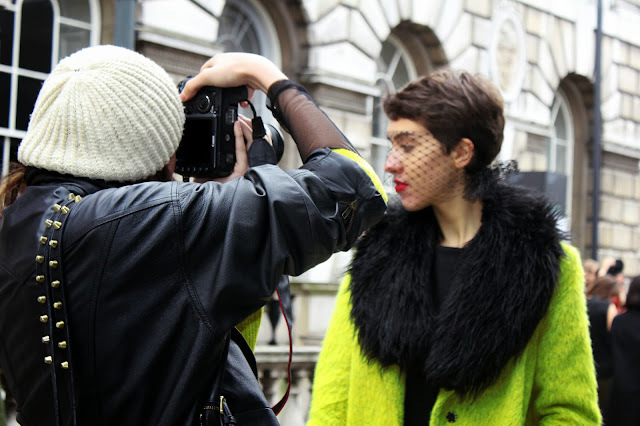 Three words: London Fashion Week. Where do I even begin to start explaining this surreal experience? money. The brightness of this jacket certainly made up for the lack of sunshine! I teamed this blinding wool coat with a more neutral palette which consisted of this season’s staple white pencil skirt and a black origami style jumper- both of which were from Zara. I then paired my favourite matching metallic Zara pumps and Monki oversized clutch to add some contrast to the outfit. Lastly, as I was rushing out of the door I felt a bit spontaneous and wrapped some netting around my face (as you do) which created a sort of abstract masquerade. 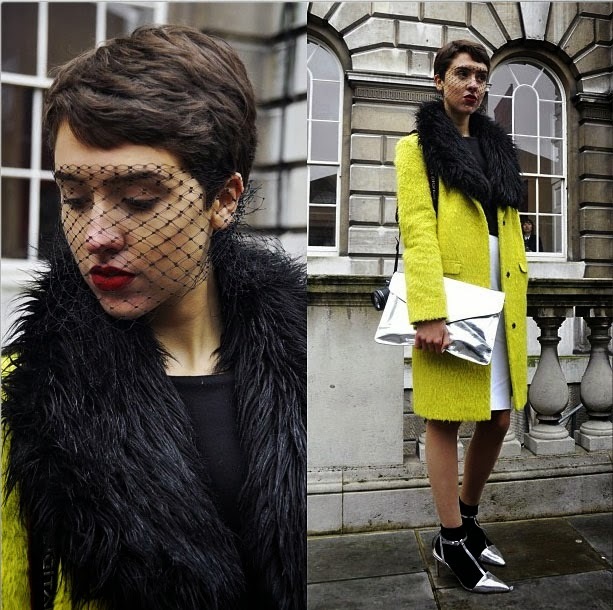 Despite the rain smacking on my very impractical silver pumps I stumbled my way to Somerset House and within minutes of walking in I was bombarded with photographers, bloggers and journalists asking me about my attire. I actually felt like I was on the red carpet of the Oscars minus the 40 degree heat *sigh*. The next eight hours rushed by. Every minute consisted of interviews or the continuous flash of cameras- even when eating my lunch which was already difficult considering my face was caged with a net! However the bitter cold and blisters were worth it. I was fortunate enough to be photographed and interviewed for Glamour Magazine, Company, the Press Association, Yahoo, New Look TV amongst many other international and independent magazines, YouTube channels and TV stations. There was a great buzzing atmosphere in Somerset House despite the gloomy weather which certainly didn't crush the mood or people’s wardrobe choices. It was an enthralling experience to see so many various styles of fashion in one compact place. It was touching to see so many people of different ages, nationalities and careers come together as one by the power of fashion. Tartan was a very popular choice of material as were bright neon’s however I didn't stumble across the same outfit once; I definitely picked up some fashion tips and inspirations which I can’t wait to try! It was rather surreal to see such a variety of style in one place, especially when I stumbled across some of my favourite fashion bloggers who inspire me so much. Throughout the day I met so many interesting bloggers, journalists, photographers and class mates from my university, Central Saint Martin’s; I’d like the thank each one of you for making the day such an enjoyable experience! The day certainly became a lot more surreal when my favourite Radio 1 DJ and fellow fashionista Jameela Jamil personally came up to me and asked to take a photo of my outfit! Funnily enough I was running around Somerset House trying to catch a glimpse of her at the time she came up to me! Jameela was lovely and very easy to get on with, we got chatting and I even got to model her amazing Lulu Guinness clutch which she later Instagrammed a photo of! Funnily enough we were both wearing TopShop coats and white nail varnish! 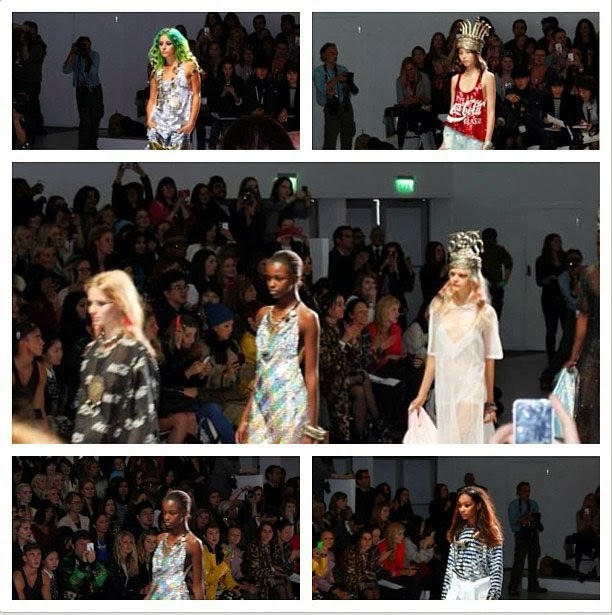 The day got even better when I attended my first ever catwalk shows which were Holly Fulton, Ashish and David Koma. I genuinely had to pinch myself to make sure I wasn’t dreaming when sitting third row at the iconic LFW runway (not a bad seat for my first show!). Considering I started reading Vogue from as young as I can remember, this was a dream come true. Its weird to think that I was sitting metres away from some of the biggest fashion names, designers and bloggers. Even Ellie Golding and Paloma Faith made an appearance at Ashish, it was impossible to not notice Paloma's fiery red hair! Both shows were phenomenal in their own ways (I will do a separate post on them very soon), and in all honestly the shows were just as I imagined- loud, snappy, fierce and totally over the top- but it’s an experience I will definitely cherish even if it lasted just a mere few minutes. On the official LFW catwalk! The day flew past and before I knew it the darkness and lack of sufficient lighting of the catwalk shows had spread outside. I finally departed Somerset House when they stopped distributing the free popcorn and energy drinks at the catwalk entrances. None the less Saturday the 14th was by far the most unforgettable and best (fashion) days of my life. I loved every second of it and I can’t wait for the next season! 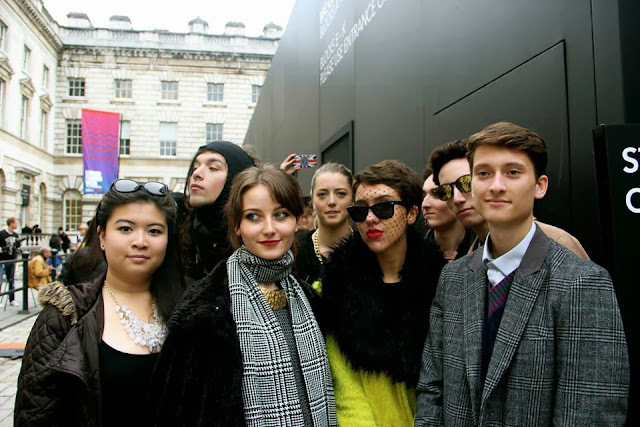 p.s if I met you at LFW don’t be afraid to follow my blog or email me, check out the links on the sidebar! you look so awesome, no wonder you got papped everywhere!